Welcome to Language for Fun Nantwich and our lovely, lively language lessons for adults with Elisa! We offer fun, stress-free lessons with no exams and no compulsory homework in relaxed but highly structured and effective classes, where a large part of the lesson is spent talking to other learners. Our conversations have been created specifically for adults, rather than teenagers and we try to create a dinner party/coffee morning atmosphere, where we make sure that everyone feels at ease and able to join in! UT the waiting list is open! To book your taster session or for more information please contact Elisa. Each term is for a block of 10 lessons with a break at half term for the benefit of those with school age children. Elisa is a native Italian speaker from the city of Lucca in Tuscany. She has always wanted to work in teaching but trained as a graphic designer, specialising in instructional design. She graduated in Digital Humanities from the University of Pisa in 2009. Soon after starting her first job, Elisa began leading courses in English, IT and graphic design. She took on extra training to boost her teaching skills, working with students both online and in the classroom. Elisa later moved to Toronto, Canada, for a couple of years before settling in the West Midlands. 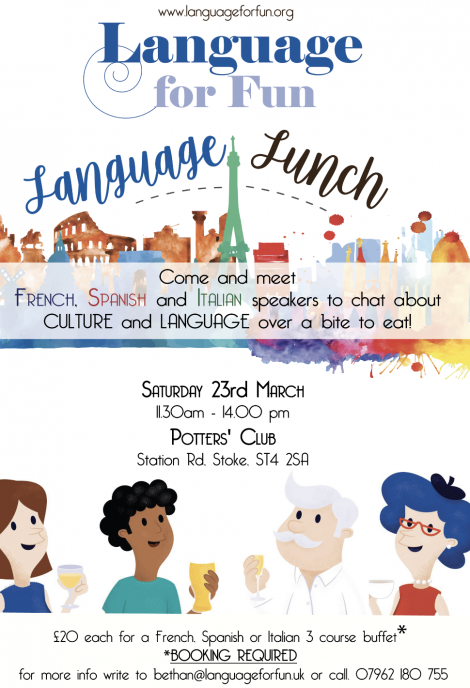 She now holds the Italian license for Language for Fun in Newcastle-under-Lyme, Nantwich, Market Drayton and Shrewsbury. In her spare time Elisa loves to get creative and her hobbies include crochet, photography, cake design and painting role-play miniatures. She is also a keen reader and especially enjoys historical novels and fantasy.